From the product description, it looks like the Premium Floor-standing Patio Heater from ThermoTiki has got all the bells and whistles. But do these features deliver what they’re set out to do? In this review, we provide a detailed, yet concise look at this unit. In a hurry? Click here to get ThermoTiki’s Premium Floor-Standing Patio Heater! – ANSI-, CE-, and CSA-compliant. – Assembly. It appears that buyers had no problem with the assembly, saying that it came with easy instructions to work with. – Performance. There are opposing feedback as regards the unit’s heating capacity. The description says that it can heat up to a 15-foot diameter, and some buyers seem to agree. According to one, the ThermoTiki Floor-Standing Propane Patio Heater “puts out as much heat as a fire.” But others, though, don’t agree. – Others. One buyer said that the fire cover that comes with it looks “very cheap.” And while the wheels provide excellent maneuverability, caution must be made as the heater can be somewhat unstable during the movement process. If you’re looking for an inexpensive floor-standing outdoor patio heater, consider the Premium Floor-Standing Propane Heater from ThermoTiki. It is easy to install and lights up fairly quickly. But although some buyers are impressed with its performance, consider what others have to say — that it may not put out the heat you’d expect. 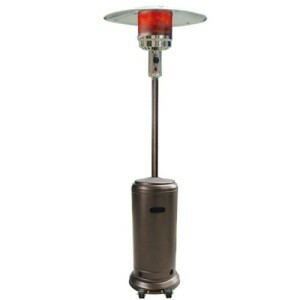 Get the ThermoTiki Floor-Standing Propane Patio Heater here!